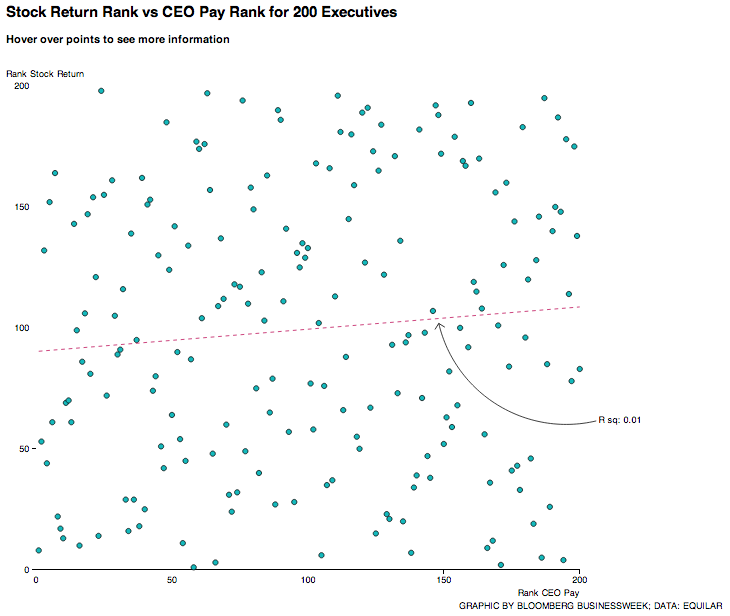 CEO pay for performance: This graph shows why it's a sham. Larry Ellison’s pay dropped 18 percent to a mere $78.4 million last year. CEOs are supposed to be paid for their performance, which is why the rest of us mortals are supposed to be comfortable with their astronomical compensation packages. Chief executives are made rich for making their shareholders rich, the argument goes. What’s so wrong with that? As Danielle Kurtzleben at Vox notes, many economists have studied the question of whether CEOs are actually paid based on their successes and reached different conclusions. Critics have argued that clubby corporate boards, often made up of former executives, simply fail to police CEO pay. A 2008 paper by Xavier Gabaix and Augustin Landier concluded that the entire “six-fold increase of U.S. CEO pay between 1980 and 2003 can be fully attributed to the six-fold increase in market capitalization of large companies during that period.” In 2009, however, researchers from Purdue and the University of Utah found that companies in the top 10 percent of CEO pay tend to underperform the stock market—giant pay packages correlated with worse performance. And some have found that CEOs basically benefit from dumb luck; for instance, oil executives are paid more when crude prices jump. Equilar’s own research, meanwhile, shows that linking CEO pay to certain metrics, like earnings-per-share based on generally accepted accounting principles, leads to better stock performance than others do. In short, sometimes CEOs are paid for the value they add. Businessweek has given us another reminder that sometimes—upsettingly often, in fact—they’re not.